The only advertising & bounty management platform worth joining. 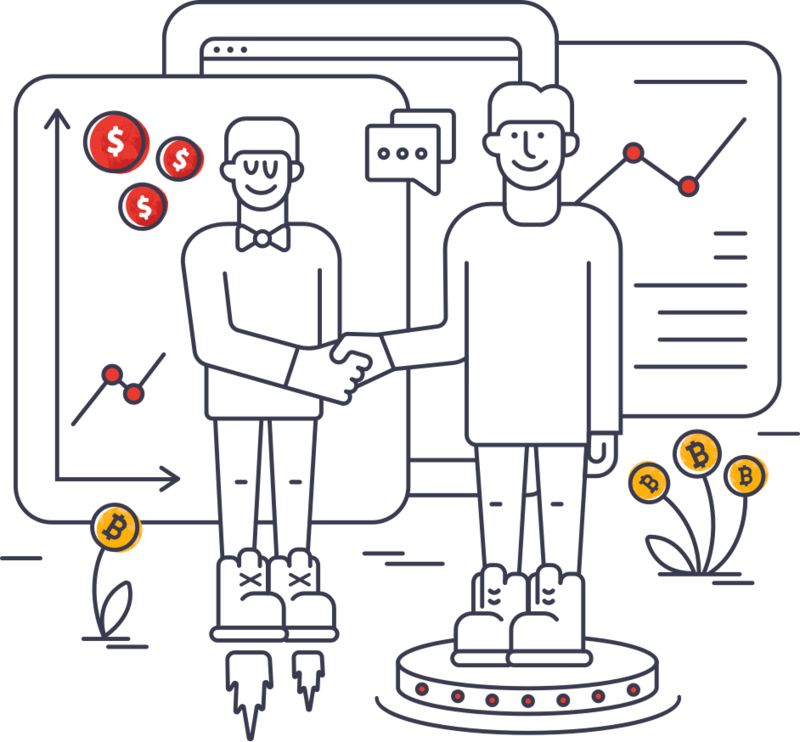 The core idea behind our project is to provide the advertisers with the highest possible conversion rates while help bounty hunters & publishers make more money along the way. We're the all-in-one platform for crypto marketing. We are redefining advertising networks, one client at a time. choose this way iconCreated with Sketch. Giving a new meaning to the bounty campaign solutions. with social media promotion, we have created our deadly efficient solution. Best rates and best services offered to the pioneers of advertising and publishing. Brand new bounty platform to forever change the landscape of the crypto market. Proficient package containing everything from PR to crypto influencers. Help us usher in the new era of crypto advertising by joining our cutting-edge solution. Reliable way to earn tokens for bounty hunters. Most successful hunters rewarded with extra money. Automatized reporting process: likes, shares & reposts. No bots & no low-quality submissions. 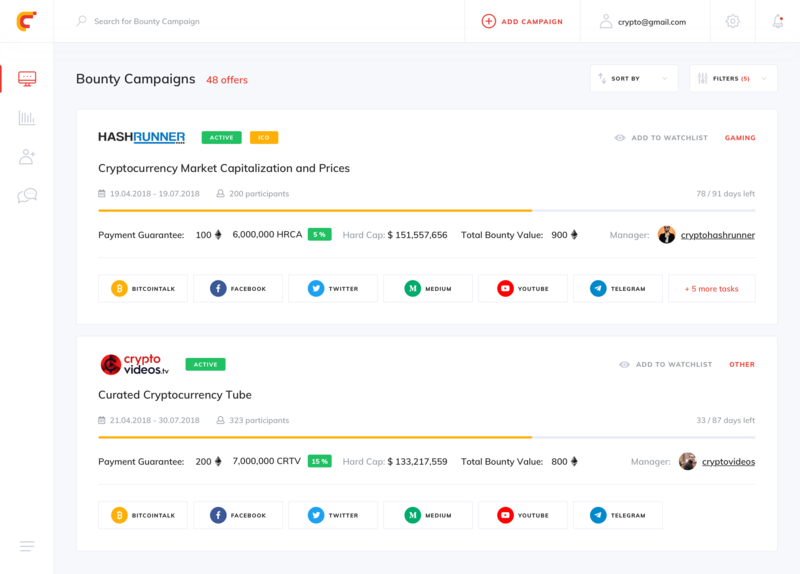 Manager can control every stage of bounty campaign. Down below, you will find frequently asked questions in regards to CryptoTraffic network. If you don't see your question among them, you can contact us via email. 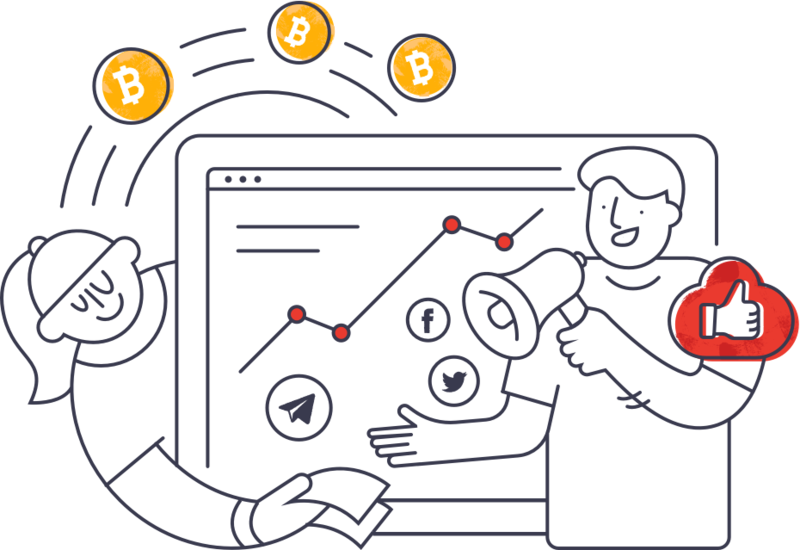 CryptoTraffic is an advertising platform combining banner ads and bounty marketing. How do I promote my ICO on your platform? We will be happy to offer our services. We can aid you in advertising your project or product. Please get in touch with us via email - info@cryptotraffic.net. Our bounty manager will contact you to further discuss your campaign. What are the benefits of CryptoTraffic? Our platform offers the most cost-effective advertising opportunities. We can safely guarantee the highest possible conversion rates. Can I run a bounty campaign if my project is not an ICO? Yes, you can. We can run a bounty campaign for any crypto project, even if you don't have an ICO. Write us a detailed email and we will come up with a solution fit for your project. We accept the following - Bitcoin, Ethereum, fiat via wire transfer. How do you drive quality traffic only? Our foolproof system closely monitors traffic sources which completely eliminates the possibility of fraud. If your website gets organic traffic, you can sign up as a publisher and submit your site for verification. The verification process usually takes up to 2 business days. You can withdraw your earning after the withdrawal hold period (7 days). The minimum withdrawal amount is â‚¬25. In order to become a bounty hunter, you need to sign up on our website and link your social media accounts. After that, you can actively promote ICO campaigns. You will receive the reward in accordance with the number of tasks you've completed. The token distribution normally happens in the span of 2-3 weeks after the campaign finishes. 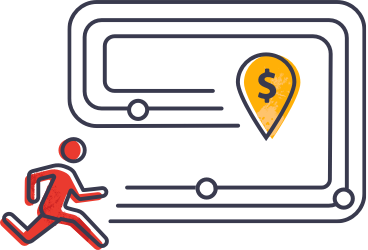 Guarantee payments is the amount of ETH you will be paid from CryptoTraffic. Are there any exclusive campaigns? CryptoTraffic offers many exclusive opportunities that you won't be able to find elsewhere. What is a non-ICO bounty? What are the benefits? These are the projects operating on the same principles as typical ICO bounty campaigns. However, they are not ICOs. You can still complete tasks and be rewarded accordingly. Why my social media accounts are being denied? We carefully monitor every applicant. You need to make sure that your social media accounts are professional. If you have further questions, feel free to contact our support team. How do I start an ICO promotion on your platform? Please contact us via email at info@cryptotraffic.net. What are the benefits of CryptoTraffic.net? We are making bounty management less time-consuming and more cost-effective by automatically calculating stakes and counting reports. 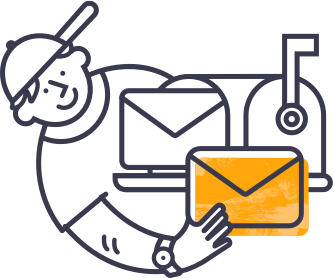 The system is entirely adjustable, you can set up your micro-manage every detail of your campaign. Are there any extra bonuses for managers? Are there any extra benefits for the managers? Of course there are additional benefits for the managers! We have long-term partnerships in mind, so if the managers are doing great work, it's in our best interest to reward them accordingly in order to ensure long and fruitful relationship. Reach out to us and weâ€™ll get back to you shortly. Enter your email address below, and we'll let you know as soon as we are ready to work. iconCreated with Sketch. iconCreated with Sketch. iconCreated with Sketch. iconCreated with Sketch. iconCreated with Sketch. iconCreated with Sketch. Advertiser Publisher Bounty hunter ICO Manager iconCreated with Sketch. Cryptotraffic ensures that your personal data will never be sold or disclosed to other third-party entities or organizations for commercial purposes or otherwise. Cryptotraffic complies with all security standards of the industry in order to protect your personal data from being accidentally lost, used and accessed in an unauthorized way, as well as altered or disclosed. In case of a privacy violation or complaint, we recommend that our users use the “Report Section,” or contact us directly at report@cryptotraffic.com. This way, we will be able to investigate the matter as soon as possible. If you would like to know what information we have about you, you can simply request it from us. You may also ask us to correct or delete your personal data. You can do this by sending us an email at report@cryptotraffic.com. Please clearly state in the subject whether it is a request to access, to modify, or to delete your data. Please take into account that cryptotraffic might ask you for additional information in order to determine your identity. Users are afforded various rights in regards to their personal information and how cryptotraffic collects that specific information. Other than situations where an exception or exemption applies, these rights include the right to be informed about data processing, to access, correct, and request the removal of your personal information. You also have the right to request us to stop the processing of data, to reuse the data for other services, object to the processing of the data, and the right to be protected from automated decision-making processes. cryptotraffic will not request any sort of fees when and if you request to access your personal data (or request any of the other rights). 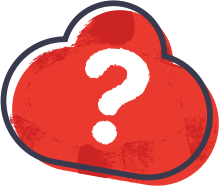 However, we may need to request specific information from you to help us confirm your identity and ensure your right to access your personal data (or to exercise any of the other rights). These Terms and Conditions (also "Agreement") shall govern the commercial relationship between you and us. Where used in this Agreement, references to: (a) "we", "our", "us" means Amstars OÜ, registry code 14425855 and, as applicable, any of its directors, officers, shareholders, employees, advisors, contractors, subsidiaries and any of its affiliated corporate entities, being an advertising network that provide services for products monetization and promotion, connecting advertisers and publishers through such service globally (“Services”) and (b) "you” and/or "your" mean the individual or entity who wishes to use our Services as a publisher. By checking the box and clicking “I have read and accepted the Terms and Conditions” button or by clicking “Accept Terms and Conditions” button, as applicable, or by continuing to use any of our Services, you (a) confirm that you are aware and comply with the present Agreement and agree to be bound by this Agreement and (b) represent and warrant that you are authorized and lawfully able to enter into this Agreement. Additional terms or service conditions may apply and be shown separately. These additional terms become part of your Agreement with us and all the policies made available to you therein must be followed. If you do not agree to all the terms and conditions of this Agreement, then you may not use any of our Services. We reserve the right, at our sole discretion, to change, modify, add or remove portions of any part of these terms and conditions, at any time. We will notify you about the changes to the terms and conditions either by e-mail, your Account (if any) or through the Website. Your continued use of our Services or Platform means that you accept and agree to the changes. 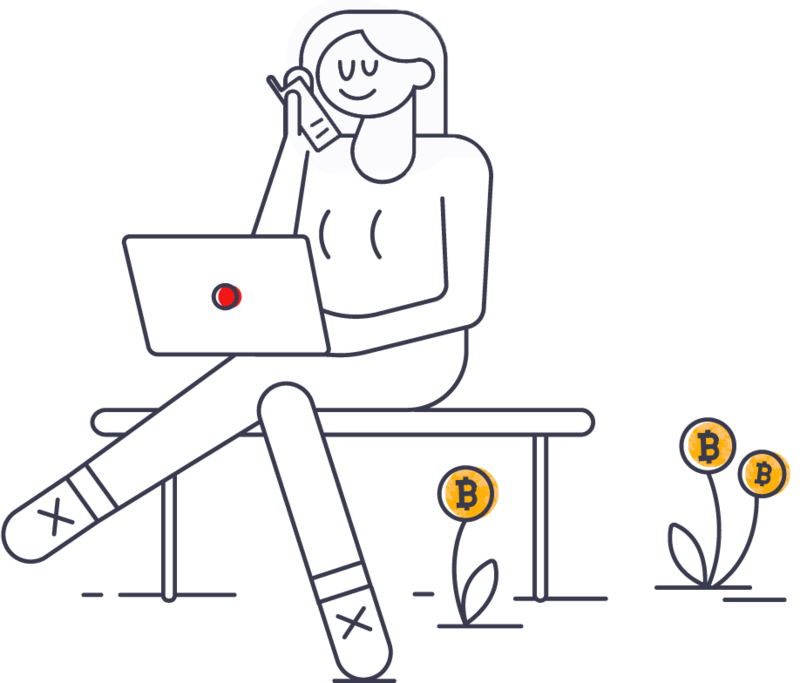 Account: an account on the Platform, which is created through the Website and used to access your payment details, financial data and other information. Advertiser: any individual or entity with whom we have entered into agreement for running of one or several Campaigns through the Platform. Bounty Hunter: any individual or entity with whom we have entered into agreement for running of one or several ICOs and tasks through the Platform. Bounty manager: any individual or entity who connect Projects or ICOs and bounty hunters, who check and monitors the performance of work done by bounty hunters. Advertising Format: a position and way of appearance of an advertising on the Publisher Site. 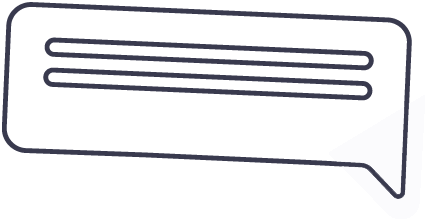 Advertisement Code: line or lines of code inserted within the source code of the Publisher Site that are designed to launch the agreed Advertising Format. Agreement: any standard terms imposed by us to regulate the commercial relationship between you and us, including these terms and conditions. Artificial Traffic: Impressions that result from a fault or whose origin is automatic operations not resulting from Internet user actions, or resulting from the intervention of elements including, but not limited to, bots, robots, requests emanating from electronic mail and chat rooms, script generators and links placed on sites unknown to us, Publisher or Advertiser. Campaign: an organized set of marketing operations designating the operations set up by Advertiser with the aim of promoting Advertiser’s website, services and/or products. CPM or Cost per mille: the amount payable by us to Publisher each 1,000 Impressions of each Advertising Format delivered to us. Commission: designates the remuneration due to the Publisher within the terms of this Agreement. Impressions: a measure of the number of times an advertisement has been rendered on a user's screen. 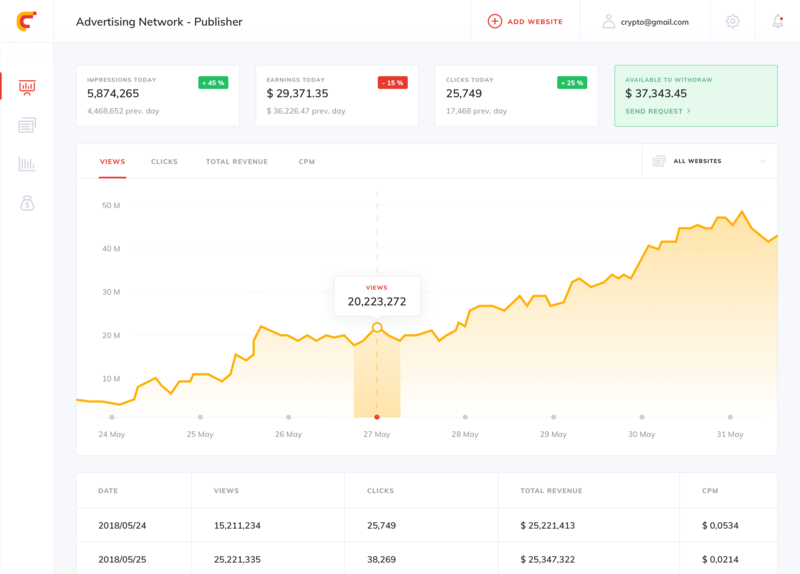 Platform: our digital advertising network and CryptoTraffic.net available at the Website, connecting Advertisers, Publishers, ICOs, Projects and Bounty Hunters using Services. Publisher: any individual or entity who has entered into this Agreement, in order to commercialize all or part of the advertising space on the Site(s) that they publish. Publisher Site or Site: any website owned and/or managed by Publisher containing places for Advertising Formats. In order to become a Publisher, Advertiser or Bounty Hunter, you must first register an Account on the Platform and be in compliance with present Agreement (in case of using Self-service) or register as a Publisher by contacting us directly for acceptance (in case you wish our Management-service). Self-service assumes that access to the Services shall be provided through your Account. Management-service assumes that assistance in using the Services and Platform shall be provided by our team. Any natural person with full active legal capacity or any legal person may apply for an Account. You must provide your real name(s) and full personal and/or company registration information including payment data, if required. All information you provide upon registration must be accurate and up-to-date. You may not provide any false information, or create an Account for anyone other than yourself without respective authorization. The representative of a legal person making the Account on behalf of the legal person must ensure that he has all the necessary rights and powers to do that. In order to verify your Account, we may request additional verification information, such as a copy / scan of your passport, ID card, driver’s license, utilities bills, payment method details. We reserve the right to accept or reject your Account registration request without additional explanation. Registering an Account on the Platform implies full and total acceptance of all our policies, including these terms and conditions. You are entirely responsible for maintaining the confidentiality of the information you hold for your Account, including your password, and for any and all activity that occurs under your Account as a result of you failing to keep this information secure and confidential. You have to notify us immediately, in case of any unauthorized use of your Account. You may not transfer your Account to anyone without our explicit written permission and you may not use anyone else’s Account or password at any time without the express permission and consent of the holder of that Account. In case we find at our sole discretion that there is a threat that you are engaging in any suspicious activity, you have violated the Agreement or it is necessary for security reasons, we may temporarily suspend your Account until the cause for suspending your Account has been eliminated; or if that cannot be eliminated or you refuse or fail to eliminate it, block your Account. For security reasons we may in addition block your access to the entire Website. You agree that we will not be liable to you or to any third party for termination of your access to your Account and/or the Website as a result of any violation of the Agreement by you. In order to use our Services you must keep your Account active. If it is inactive for a period of 180 consecutive calendar days, it will be marked as inactive. In this case you will get a respective notification by email. You will have 90 calendar days to reactivate your Account. To do so, you have to login to your Account and follow the steps described there to reactivate your Account. If your Account is not reactivated within 90 calendar days it will be archived without option to restore it. If you leave your Account balance unused for 180 consecutive days, or if you delete your Account and leave a balance, or if we suspend or block your Account and you do not meet any conditions necessary to reinstate it within 90 days, we may process your balance to zero. If your Site has been approved, you are entitled to install Advertising Code(s) within the source code of your Site and place the ads of Advertisers on your Site in compliance with our policies. You agree that installation of the Advertisement Codes required to display the Campaigns advertisements on your Site is fully under your responsibility. You further agree and confirm that the Advertising Code may be placed only on Sites that have been approved by us. If you place the Advertising Code on a Site that has not been approved by us, we may void the Impressions related to such Site. Your Account identifies one or several unique Sites. 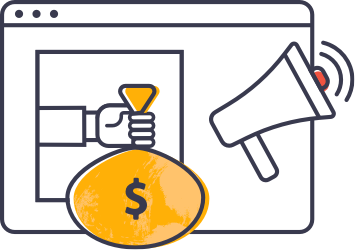 If you wish to display Campaign ads on several Sites (different names) you should register all of them in order to have a correct overview of your incomes. You may add and edit any Site from your Account at any time. Visitors of the Publisher Site may not be misled in any way and should be able to easily distinguish content from ads. You are prohibited from placing ads under misleading headings or titles. 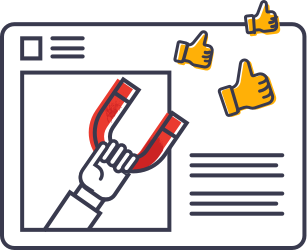 If pop-ups are displayed on your Site, they may not interfere with the site navigation, change user preferences, initiate downloads or distribute viruses. You must ensure that no ad network or affiliate or any other user uses such methods to direct users to pages that contain Advertising Code. If you place third party ads on your Site, it should always be clear to Internet user that these ads are served by different advertising networks and that such ads have no association with us. In addition, you agree not to place Campaign advertisements on a page that contains only or principally advertising messages. You may not, without our prior consent, change the agreed location of Advertising Formats or way of their appearance and, in case the Advertising Format includes static banners, not to place any new and/or additional advertising formats to your Site above our static banners or so that such new and/or additional advertising formats would negatively affect the visibility and/or effectiveness of our static banners. You are strictly prohibited from altering, changing or amending the Advertising Code and/or using a third party’s ad platform with the aim to alter, change or amend the Advertising Code, without our prior written consent. If a Campaign advertisement is not in compliance with the terms of this Agreement, you may remove the Advertising Code from your Site only after your have notified us thereof and we have failed to bring the Campaign advertisement into compliance with the Agreement within 24 hours after receipt of the notice from you. You acknowledge and agree that we have the right to request you to stop displaying Campaign ads on all or some of your Site(s), irrespective whether that particular Site has been previously registered and validated or not. Should you refuse to comply with our request, we have the right to immediately terminate your Agreement with us. In any event, you acknowledge yourself to be completely independent from us. Consequently, you state and guarantee to us that you have proceeded with, or will proceed with, at your own cost and as your sole responsibility, all the required administrative obligations (e.g. obligations related with social security, taxes and any other applied obligations) concerning the activities you perform via Website or Platform. Owners of third-party projects can use our CryptoTraffic.net with subdomain (or without) for control and verify the participants. CryptoTraffic.net does not store tokens. CryptoTraffic.net is not responsible for the projects on the platform. CryptoTraffic.net is not responsible for the distribution of tokens. CryptoTraffic.net and project owners or managers reserve the right to make amendments to the bounty campaign at any time. CryptoTraffic.net and project owners or managers reserve the right to remove stakes/participants from the bounty campaign for any reason such as unethical behaviour and fraudulent submissions. We take all possible measures to preserve the correctness of the information, But you expressly acknowledge and agree without any reservation that we are not liable, nor shall we become liable at any time in the future, for any event which may cause or result in the corruption of data, their incorrect collection or processing, their alteration or loss in transfer, or other malfunctions, and the consequences of such events, irrespective of whether such event is caused by us or a third party. You further expressly acknowledge and agree that participation or performance in the BOUNTY CAMPAIGNS and others does not convey the express or implied guarantee or promise on part of BOUNTY CAMPAIGNS of any payment or provision of any benefit, irrespective of your conduct, performance or its result. By your participation in the BOUNTY CAMPAIGNS you further expressly acknowledge and agree that CryptoTraffic.net and project owners or managers reserves the right and is entitled anytime, without prior notice, to change the terms or terminate the Bounty Campaign in part or wholly, without any compensation to you for its termination, change and their consequences. You are responsible for keeping your Site always online, functional and reachable by the users from all over the world. You should always test your Site to make sure that it appears correctly in different browsers and monitor your Site’s performance and optimize load times. You must monitor your Site for hacking and remove hacked content as soon as it appears. You must create a useful, information-rich Site with clearly and accurately described content. You are not allowed to create multiple pages, sub-domains, or domains with substantially duplicate content. You should avoid “doorway” pages created just for search engines, or other “cookie cutter” approaches such as affiliate programs with little or no original content. You must provide unique and relevant content that gives Internet users a reason to visit the your Site. The Publisher Site should have a clear hierarchy and working text links. Every page should be reachable from at least one static text link. You declare and guarantee that the Publisher Site is not and does not contain: fully or partly not working Site; Site without content; violent content; racial, ethnic, political, hate-mongering or otherwise objectionable content; hate speech, harassment, bullying, or similar content that advocates harm against an individual or group; excessive profanity; hacking or cracking content; illicit drugs and drug paraphernalia content; content that promotes, sells, or advertises products obtained from endangered or threatened species; software pirating; investment, money-making opportunities or advice not permitted under law; sales of illegal substances or activities (e.g. illegal online gambling, counterfiing money, etc); content regarding programs which compensate users for clicking ads or offers, performing searches, surfing websites or reading emails; and/or any other content that is illegal, promotes illegal activity or infringes on the legal rights of others. Publisher Site may not be loaded by anything that: triggers pop-ups automatically; modifies browser settings; redirects users to unwanted websites; and/or otherwise interferes with normal site navigation. After placing the Advertising Code on the Publisher Site, we will perform an initial check of your submission regarding technical quality, and determine if ads can be displayed on your Site according to our advertisement placement policy. Publisher Site submission may be rejected if it does not meet these conditions. We have the right to check your compliance with this Agreement at any point during the Agreement is valid. Failure to meet the conditions set forward (including engagement in fraudulent or illegal activity) may result in suspension or termination of the Agreement, banning of your Account and/or withholding any Account balance. You are expressly prohibited from using any means, devices or arrangements to commit fraud, violate an applicable law, interfere with other affiliates or falsify information in connection with the Services or generating of remuneration or exceed your permitted access to our Services. Further, you are expressly prohibited from taking any of the following actions: (a) excessive page refreshes, generated either manually or automatically; (b) third-party programs with user incentives, such as paid-to-surf or auto-surf programs; (c) using one or several maneuvers that give rise to Commission and/or (d) using automated online robots, or other deceptive software that are programmed to interact with advertisement. Besides artificial activity you must avoid the following techniques: automatically generated content; participating in link schemes; ad cloaking and sneaky redirects; hidden text or links or doorway pages; creating pages with malicious behaviour, such as phishing or installing viruses, trojans, or other bad ware; make any modifications to the Advertising Code; generating Artificial Traffic by an Advertising Code; and/or intentional deception involving financial transactions. You are prohibited from offering compensation to Internet users for viewing Campaign ads or performing searches, promising to raise money for third parties for such behaviour or placing images next to individual ads. You declare and guarantee that you obey the laws regarding copyright ownership and use of intellectual property. You shall be solely responsible for any violations of any relevant laws and for any infringements of third party rights caused by any content you provide or transmit. You further declare and guarantee that you have the necessary legal rights to display that content protected by copyright law, if any, on your Site. This includes displaying copyrighted material, hosting copyrighted files, or providing links driving users to sites that contain copyrighted material. You declare and guarantee that your Site does not offer for sale or promote the sale of counterfeit goods. You must compensate to us any loss incurred to us with your fraudulent or other illegal activity. For compensation we may use any of your funds accessible to us by making settlements and deductions. If we suspend you in any fraudulent activity we shall have the right to ban your Account, withhold your Account balance and take all necessary legal actions to restore the damage caused by such violation. All Campaign advertisements carried out on your Site with fraudulent activities are not subject for payment. You will receive from us Commission for displaying Advertisers’ Campaign ads on your Site. The amount of Commission shall depend on the agreed CPM. All statistical data for the purposes of billing and general delivery reporting are based on our reporting system only. Your daily Commission that you have earned based on the statistical data shall be added to your Account on the following day. You fully acknowledge the trustworthiness of this statistical data, which will prevail in the event of a dispute, with regard to the measurement of all Impressions. Your Account statistics are available for the last 6-month period only. If at the end of the validity of the Agreement it appears that you have on your balance un-invoiced Commission, you may request for the payment thereof within 30 days after the termination of the Agreement, provided that the amount of your un-invoiced Commission meet the payment threshold. We have the right to make adjustments to your balance in one of the following cases: (a) deduct transaction and payment fees, (b) due to technical reasons, (c) due to fraudulent activity, (d) due to Advertiser’s complaints or refunds and/or (e) on the basis of additional agreements with you. Minimum payment threshold for Publishers is 25 EUR, before tax each month. Daily balance reports can be found in the Account. If your Account reaches the payment threshold, you will be able to submit a payment request, specifying your payment data (i.e. your BTC wallet address). You will bear the transaction and payment fees, if applicable. When you request your payment, we will have up to 10 calendar days starting from the date of payment request to validate your request and up to 5 calendar days to proceed with the payment for validated invoices. If your request is refused due to fraud, we have the right to apply all sanctions stipulated in the Agreement. You expressly agree that the Commission shall be paid in Bitcoins (BTC) to your BTC wallet address, unless agreed otherwise between you and us. The EUR/BTC exchange rate shall be fixed by us as at the date of making the payment on the basis of rate determined by Dooga Limited, registered in the UK at c/o Gordon Dadds, Agar Street 6-11, London WC2N 4HN, United Kingdom ( https://cubits.com/ ). As a Publisher you must ensure your capability to receive payments from us and submit valid payments details in the Account. If the receipt of Commission or any other payment from us fails or is delayed due to your failure to comply with this obligation (including if you have provided incorrect or wrong payment details), we shall not be liable for such failure or delay. In any event, all payments will be made at the payment details specified in your Account. You agree that we are not responsible for any actions applied by the payment service provider including but not limited to any additional transaction fees applied to your account. We have the right to switch payment service provider(s) at any time without notifying you. Unless expressly authorized in writing by us, you may not require us to transfer your Commission or any other payment you are entitled to under the Agreement to a third person. We may, in our sole discretion, refuse to process a payment (and may place a payment hold) on any part of your Account for any reason, block your Account and terminate this Agreement, including if we have a reasonable suspicion that you have breached any provision of this Agreement. We also reserve the right to set-off any amount you owe us, including for breaches of this Agreement. Hereby you represent and warrant to provide us with all the documentation or its equivalents, needed for your identification, ascertainment of the legal fact and fulfillment of our obligations under this Agreement, within 5 business days from the date of request. In certain cases, we may withhold all payments until we will receive relevant documentation from you. You as a Publisher order us to generate and issue you invoices on behalf of you. Prior to making any payment to you as a Publisher, we will generate automatically through the Platform the invoice on behalf of you. Furthermore, you as a Publisher agree that the Platform will generate the said invoices based on the data provided to us and available from Account and agree that such date is accurate, fully and legally compliant for the purposes of invoicing and taxation. All of your paid invoices will be available to download in PDF format from your Account. Any Publisher being a legal person and residing in the European Union who has provided a VAT number expressly warrants that such VAT number is, in its own country, valid for the issuance of invoices to us. You accept to be solely liable for any error, direct or indirect loss or damage arising from the inaccuracy or non-compliance of such data or the breach of any of the aforementioned warranties and, accordingly, you will hold us harmless from any of the direct or indirect loss or damages. You as a Publisher hereby confirm that another VAT invoice won’t be issued. You hereby agree to notify us if you (a) change your VAT registration number; (b) cease to be VAT registered; or (c) change your payment details. In case there is any claim, administrative proceeding from any authority, dispute or conflict, in any way due to the inaccuracy or non-compliance of such data provided by you, we are expressly authorized to retain any payments due to you until such incident has been resolved. All payments to you from us in relation to our services will be treated as inclusive of tax (if applicable) and will not be adjusted. According to the Estonian Income Tax Act, upon making a payment to any Publisher being a legal person residing at low tax rate territory, an income tax at the rate of 20% shall be withheld by us from the amount of requested Commission. An income tax shall not be withheld by us if you provide us with documentation proving that more than 50 per cent of your annual income is derived from actual economic activity. If according to applicable law it is your responsibility to declare, pay or withhold taxes on or from your transactions with us, you agree to indemnify and hold us harmless from and against any claim arising out of your failure to do so. All site, product and services content as text, graphics, user interfaces, visual interfaces, photographs, trademarks, logos, artwork and computer code, including but not limited to the design, structure, selection, coordination, expression and arrangement of such content, contained on the Website is owned, controlled or licensed by us, and is protected by copyright and trademark laws, and various other intellectual property rights and unfair competition laws. No part and no content may be copied, reproduced, republished, posted, publicly displayed, encoded, translated, transmitted or distributed in any way for publication or distribution of for any commercial enterprise, without our express written consent. You may use information about our Services purposely made available by us for downloading from the Website, provided that you use such information only for your personal, non-commercial informational purpose and do not copy or post such information on any networked computer or broadcast it in any media. You may not attempt to gain unauthorized access to any portion or feature of the Website, or to any our server, or to any of the services offered on or through the Website, by hacking, password “mining” or any other illegitimate means. You may not reverse look-up, trace or seek to trace any information on any other user of or visitor to the Website, or any other our customer, including any Account not owned by you, to its source, or exploit the Website or any service or information made available or offered by or through the Website, in any way where the purpose is to reveal any information, including but not limited to personal identification or information, other than your own information, as provided for by the Website. You may not use the Website or any its content for any purpose that is unlawful or prohibited by this Agreement, or to solicit the performance of any illegal activity or other activity, which infringes our or others’ rights. Subject to your compliance with this Agreement, we grant you a revocable, limited, non-exclusive, non-transferable and non-sublicensable license to access and use our Services and Platform. You are fully responsible for the due performance of your obligations under the Agreement and must compensate to us any and all damages caused by the non-performance or unsatisfactory performance of your obligations. You agree to indemnify, hold and defend us, our officers, directors, shareholders, predecessors, successors in interest, employees, agents, clients and partners, harmless from any demands, loss, liability, claims or expenses, made against us by any and all third-party claims and liabilities arising out of or related to or in connection with your use of the Website, including any served content that is not provided by us, your use of our Services, or your breach of any term of the Agreement. You shall notify us immediately of any matter which could result in any loss, claim, damage, expense or liability subject to indemnification under this section. Such notification will not release you from your indemnification duty. We reserve the right to exercise sole control over the defence, at your expense, of any claim subject to indemnification under this section. If your Agreement with us is terminated due to the violation of Agreement by you (e.g. due to your fraudulent activity), we may demand from you a contractual penalty in the amount of your un-invoiced Commission and set-off our claim for the contractual penalty against your claim for payment. We do not promise that our Website or any content, Services or feature will be error-free or uninterrupted, or that any defects will be corrected, or that your use of the Website and Services will provide specific results. The Website and its content and our Services are delivered on an “as is” and “as available” basis. All information provided on the Website is subject to change without notice. We cannot ensure that any files or other data you download from the Website will be free of viruses or contamination or destructive features. We disclaim all warranties, express or implied, including any warranties of accuracy, non-infringement, merchantability and fitness for a particular purpose. We disclaim any and all liability for the acts, omissions and any conduct of any third parties in connection with or related to your use of the Website and/or any our Services. Your sole remedy against us for dissatisfaction with the Website or any content or our services is to stop using the Website or any such content or our Services. This limitation of relief is a part of the bargain between you and us. No claim for a breach of any our representation or warranty shall be actionable or payable if the breach in question results from or is based on a condition, state of facts or other matter which was disclosed to you and/or actually known by you. We reserve the right to do any of the following, at any time, without notice, to: modify, suspend or terminate operation or access to the Website for any reason; modify or change the Website and any applicable policies or terms; and/or interrupt the operation of the Website as necessary to perform routine or non-routine maintenance, error correction, or other changes. In no event will we be liable for any direct, indirect, special, incidental, consequential or punitive loss, injury or damage of any kind (regardless of whether we have been advised of the possibility of such loss) including, but not limited to, any loss of revenue, income or profits, loss of use or data, or damages for business interruption. Our liability arising under this Agreement, whether in contract, tort (including negligence) or for breach of statutory duty or in any other way shall only be for direct damages and shall not exceed the lower of EUR 10,000 or the Commission payable by us to you over the three month period immediately preceding the date of the claim. The provision of this section 15 determine the allocation of risks between you and us, and you agree and acknowledge that such allocation of risks and the limitations of liability specified herein are an essential basis of the bargain between you and us. You and us shall not be liable for delays or failure to perform under the Agreement which result directly or indirectly from any cause or condition beyond its reasonable control, including but not limited to, any delay or failure due to any act of God, act of civil or military authorities, act of terrorists, civil disturbance, war, strike or other labour dispute, fire, interruption in telecommunications or Internet services or network provider services, failure of equipment and/or software, other catastrophe or any other occurrence which is beyond its reasonable control and shall not affect the validity and enforceability of any remaining provisions (force majeure). Your Agreement with us becomes effective upon registration of your Account or upon signing any additional agreement with us and is valid for unspecified period. Each party is within its rights entitled to terminate the Agreement, for any reason, by registered mail (with notice of delivery) or by e-mail, sent by you to info@cryptotraffic.net or by e-mail from us to the e-mail address you have previously provided, giving at least 24 hours prior notice. Provided that we have made available such a possibility, you may also terminate the Agreement by deleting your Account from the Platform by way of pressing the delete button on your Account. After that we will send you an e-mail with confirmation link. If you confirm your wish to delete your account, the Agreement will be deemed terminated, your access to your Account will be closed and the provision of all our services to you stops. (f) this opportunity is set forth in any other provision of this Agreement. Upon termination of the Agreement your Account is immediately archived. All provisions of the Agreement which by their nature extend beyond the expiration or termination of this Agreement shall survive the termination of this Agreement. Termination of this Agreement will not prejudice any right of action or remedy which may have accrued to you or us prior to termination (as the case may be). Upon termination, you are required to remove promptly the Advertising Code installed on the pages of your Site(s). You agree that we may communicate with you electronically any finance information related to your Account. We may also provide notices to you by posting them in your Account on the Website, or by sending them to an email address that you have previously provided to us. Website and email notices shall be considered received by you within 24 hours of the time posted or sent. In case you have any complaints or you require additional support, please contact us through the contact form present by e-mail at info@cryptotraffic.net. 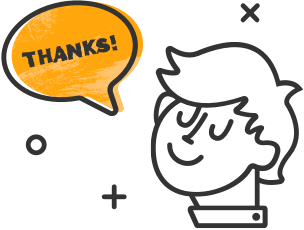 Our support team will get back to you within 48 working hours. If your inquiry requires a more detailed answer, it might take up to 7 working days for processing your request. You agree to keep all details of the contractual relationship between you and us confidential (including but not limited to information about our customers and business partners and their contact details, our products and services, technology, software, statistics, price rates and all info explicitly marked as confidential), and not to disclose information of any nature exchanged before or during the term of the Contract to any third parties, and to take all necessary measures to prevent such disclosure by your employees and agents (if any) even after they are no longer in your employ. You specifically undertake not to use the information about Advertisers directly or indirectly for your own or third party’s commercial benefit or in order to compete or cause prejudice to our activities in any manner whatsoever. The duty of confidentiality does not apply to any use or disclosure authorised by us or as required by law or any information which is already in, or becomes available to the general public other than through your unauthorised disclosure. In addition you may disclose (a) relevant information to your auditors, attorneys, credit and financial institutions, provided that the latter are also bound by a duty of confidentiality and (b) the amount of gross payments you have received from the use of our Services. You agree that we may include your name, logo and other brand features in our presentations, marketing materials, customer lists and on our Website. This Agreement shall be governed by and construed in accordance with the laws of the Republic of Estonia without regard to its principles and rules on conflict of laws. Any dispute arising out or in connection with this Agreement will be finally settled by the Arbitration Court of the Estonian Chamber of Commerce and Industry in Tallinn on the basis of the regulation of the aforementioned Arbitration Court. The arbitral tribunal proceedings will be conducted in English. The arbitration will be held by one arbitrator mutually agreed upon by the Parties, and if no agreement can be reached, then by one arbitrator who is chosen by the Council of the Arbitration Court of the Estonian Chamber of Commerce and Industry. Any claim under the Agreement must be brought within six (6) months after the cause of action arises, or such claim or cause of action is barred. There is no relationship of exclusivity, partnership, joint venture, employment, agency or franchise between you and us under this Agreement. None of us has the authority to bind the each other (including the making of any representation or warranty, the assumption of any obligation or liability and/or the exercise of any right or power), except as expressly provided in this Agreement. Whenever possible, each provision of this Agreement will be interpreted in such a manner as to be effective and valid under applicable law but, if any provision of this Agreement is held to be invalid, illegal or unenforceable in any respect, such provision will be ineffective only to the extent of such invalidity, or unenforceability, without invalidating the remainder of this Agreement or any other provision hereof. This Agreement constitutes the full and entire understanding and agreement between you and us regarding the subjects hereof and supersedes any agreement or understanding between you and us prior to signing of this Agreement. Our failure to insist on or enforce strict performance of the terms and conditions of the Agreement shall not be construed as a waiver by us of any provision or any right it has to enforce the Agreement, nor shall any course of conduct between us and you or any other party be deemed to modify any provision of the terms and conditions of the Agreement. This Agreement, and any rights and obligations hereunder, may not be transferred or assigned by you, but may be assigned by us without restriction, including without limitation to any third party. Any attempted transfer or assignment in violation hereof shall be null and void. Subject to the foregoing, this Agreement will bind and inure to the benefit of us and you, respective successors and permitted assigns. A person who is not a party to this Agreement has no right to rely upon or enforce any term of this Agreement.